The World in 2017: These Events Prove Something is Going On! Are we living in a Simulated Reality? The Game of Life and How to Play It! Does Gold Continue Its Bull Market Towards $1500 or Crash? Gold in sterling was 2.2% higher yesterday and was marginally higher in dollar terms after the Bank of England cut interest rates to all time, 322 year record low at 0.25% and surprised markets by renewing and aggressively expanding quantitative easing or QE. Sterling fell sharply on markets and gold rose from £1,014/oz to over £1,036/oz where it remains this morning. 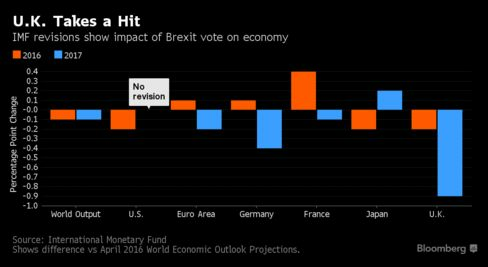 Ultra loose monetary policies are now even looser after the BOE cut interest rates for the first time in more than seven years and launched a bigger-than-expected package of monetary measures. The Bank cut official interest rates to a new record low of 0.25% from 0.5% and signalled they would be reduced further in the coming months. The deepening of ultra loose monetary policies is bullish for gold, especially in sterling terms. Sterling gold is 38.4% higher in 2016 year to date. This means that gold is now just 14% below the all time record nominal high of £1,179/oz reached on the 5th of September 2011. Gold remains one of the best performing assets in all currencies over a 10, 15 and 20 year period. Governor Carney also aggressively renewed and expanded its QE and launched a new £100bn funding scheme for banks. The BoE also launched a new £70 billion a month bond-buying programme which was quickly termed a 'sledgehammer stimulus' by analysts. This will include £10 billion of sterling denominated investment grade corporate bonds, from companies the BOE judges make a "material contribution" to the UK economy. Since 2015 I've stated the raw data published by the Australian Bureau of Statistics (ABS) on gold export to China mainland do not accurately reflect what is imported by China from the land of down under. In my previous post I've written Australia's gold "export to China" should be adjusted by Hong Kong's gold "import from Australia" as a substantial amount of gold Australia declares to export to China is in fact travelling through Hong Kong. A written statement from ABS now supports this analysis. Obviously, what we're after is exactly how much (non-monetary) gold China is importing from all countries around the world. As China doesn't disclose its cross-border trade statistics for gold, the only way to reach our objective is by establishing net gold export from all countries around the world to China, subsequently to aggregate these numbers and come to an estimate of total Chinese gold import. One of the largest exporters of gold to China is Australia, but calculating Australia's gold export to China is complicated, as we need to be cautious to avoid double counting in computing China's total net gold import. The thing is, ABS bluntly alters any "export to Hong Kong" into "export to China" when they suspect the gold is shipped to Hong Kong but will reach the mainland as its final destination – this is what ABS confirmed to me. Therefor, from using Australia's "export to China" double counting can arise when any gold flowing from Australia via Hong Kong to China would then be declared as "export to China" by Australia and "export to China" by Hong Kong. Let us clarify this subject. Have a look at the chart below. If we focus on the period from January 2013 until December 2014 we can observe that Australia's "export to China" (purple bars, data sourced via ABS/COMTRADE) roughly matches Hong Kong's "import from Australia" (turquoise bars, data sourced from the Hong Kong Census and Statistics Department). We must conclude that over this period roughly all gold Australia exported to China was transferred via Hong Kong. If we then would sum up Australia's gold "export to China" to Hong Kong's gold "export to China" this would result in double counting. The Bank of England slashing UK interest rate from 0.5% to 0.25% in a panic to save its always teetering on the edge of bankruptcy bankster brethren from going bust again and to monetize government debt by means of quantitative easing, the smoke and mirrors phrase used for the Bank of England to print another £170 billion mostly for its banking sector friends to gorge themselves on, to generate additional artificial profits. The net effect of this 'THEFT' of purchasing power is that the price savers and workers have already been paying for 8 years has just gotten a lot worse! In the past few months, we have witnessed a series of defining events in modern political history, with Britain's vote to exit the EU, (several) terror attacks in France and Germany, as well as the recent attempted military coup in Europe's backyard, Turkey. Uncertainty over Europe's political stability and the future of the EU keeps growing. These worries are quite valid, as geopolitical developments have the potential to shake markets to the core. The current high-risk environment makes it especially important to take prudent investment decisions in order to protect one's wealth. Markets have greeted the rumors of helicopter money with intense enthusiasm, beginning with Ben Bernanke's visit to Japan. This is a symptom of the economy's addiction to loose monetary policy and "something for nothing" fiscal remedies. China is desperate to solve several problems it has due to its debt to GDP ratio being north of 300 percent. It may have found a pretty unconventional one by letting companies become banks, according to a report by the Wall Street Journal. With profits headed south, heavily indebted Chinese heavy-machinery giant Sany Heavy Industries said this week it won approval to set up a bank in the Hunan Province city of Changsha. With 3 billion yuan ($450 million) of registered capital, it will be a relatively large institution as Chinese city-based banks go. Sany plans to join forces with a pharmaceutical company and an aluminum company. Sany already operates an insurance and finance division with the goal of internal financing and insurance services for clients. One problem is that companies are defaulting on bond payments and there is no adequate resolution mechanism for bad debts, at least according to Goldman Sachs. “A clearer debt resolution process (for example, how debt restructuring on public bonds can be achieved, how valuation and recovery on defaulted bonds are arrived at, the timely disclosure of information and clarity on court-sanctioned processes) would help to pave the way for more defaults, which in our view are needed if policymakers are to deliver on structural reforms,” the investment bank writes in a note. By becoming or owning banks, the companies can just shift debt around different balance sheets to avoid a default, although this is probably not the resolution that Goldman Sachs had in mind when talking about structural reforms. Another problem is that the regime has more and more difficulties pushing more debt into the economy to grease the wheels and keep GDP growth from collapsing entirely. China needs 11.9 units of new debt to create one unit of GDP growth. At the same time, the velocity of money or the measure of how often one unit of money changes hands during a year has fallen to below 0.5, another measure of how saturated the economy is with uneconomical credit. If the velocity of money goes down, the economy needs a higher stock of money to keep the same level of activity. So if companies can’t pay back loans, old banks don’t want to give out loans, and consumers don’t want to circulate the money, you can just let some companies become banks to prevent them from defaulting and maybe even issue new loans to themselves. It would not be the first time China has tried a circular financial arrangement to solve some structural issues. According to the Wall Street Journal report, the Sany Heavy Industries case is only one of a few. Other companies in the tobacco and travel sectors, for example, have taken over banks or formed new ones. We don’t know if the regulator had this in mind when they launched the initiative to boost private banks in China in 2014 in order to improve lending to the technology sector, but it did explicitly mention that private companies should form banks. “Qualified private enterprises shall be encouraged to set up private banks. The innovation of products, services, management, and technology by private banks will inject new vitality into the sustainable and innovative development of the banking sector,” the CBRC states in an undated report. It remains to be seen whether this is a long-term sustainable solution. As Mitsubishi UFJ strategist John Herrmann wrote in a note shortly after the report, the "jobs headline overstates" strength of payrolls. He adds that the unadjusted data show a "middling report" that's "nowhere as strong as the headline" and adds that private payrolls unadjusted +85k in July vs seasonally adjusted +217k. In Herrmann's view, the government applied a "very benign seasonal adjustment factor upon private payrolls to transform a soft private payroll gain into a strong gain." As he adds, slowing 2Q GDP growth of 1.2% took Sept. rate hike "off the table" and now "the million dollar question" is whether 255k payroll jobs in July, 292k in June put it back on. As a reminder, Yellen speaks exactly in three weeks time at Jackson Hole on Aug. 26; "let's see if she provides some guidance." But while rate hike odds may have spiked after today's report, it is almost certain that, as we said last night, the Fed will not dare to hike the rate in September and potentially unleash market turmoil in the most sensitive part of the presidential race. There was little incremental detail. One quarter ago, when asked about this unprecedented bearish position, Icahn Enterprises CEO Cozza said during the earnings call that "Carl has been very vocal in recent weeks in the media about his negative views" adding that "we're much more concerned about the market going down 20% than we are it going up 20%. And so the significant weighting to the short side reflects that." ... perhaps Icahn's directional fears were displaced. On the other hand, since Icahn has shown no interest in unwinding his bearish position, and has kept it identical to a quarter ago, one can conclude that the financier-rapidly-turning-politician, has merely delayed his bet for a day of reckoning for the S&P500. Perhaps this time he will be right. Until today, stocks were below water for the week, as was the US dollar, & silver & gold were higher. Then the lying government jobs report came out & restored the majick spell that deceiveth the investor world. Just for a moment, let's pretend y'all are locked up in a lunatic asylum. Surrounded by crazy people. Imagine that some of 'em run naked all the time, some of 'em wrap up in sheets and call themselves Julius Caesar, some of 'em squat on all fours and bray like a donkey, & others claim they are pigs and pour their food on the floor and eat it. You, the lone sane person, watch all this. Would there be any reason for YOU to imitate their loony behavior? Would you go naked, or wrap up in bed sheets, or bray like a jackass, or eat off the floor? Of course you wouldn't. Today we live in a monetary & financial lunatic asylum, run by lunatics (central bankers). But as a sane person, you know that humans are not donkeys or pigs and that you must keep your clothes on in public, so you don't participate in their loony behavior. Mostly this consists of PRETENDING that the economy is booming and that stocks OUGHT to be rising and that lying government reports really are true, and that any word that falls of Janet Yellen's fat, curled lip is important. Any sane person knows that all this is lunatic behavior & following it will land you penniless in the funny farm. None of this is real, or important, or productive, or valid. It's all silly, insane pretense. Thus I just sit back and shake my head on days like today. First of all, I have figured out how to tell when government officials are lying: their lips are moving. Thus I will not be sucked in by LYING government jobs reports that miraculously double the number of jobs reported in May, or report huge jumps in July. Ain't none of it so, ain't none of it real, even if every jack leg smart guy on Wall Street believes it AND buys stocks because of it. I ain't loony yet, and I ain't tearing my clothes off or eating off the floor, I don't give two hoots and a holler how many people do, I ain't never gonna do it. That is part of why I am so opposed to investing in stocks, because the whole market is an illusion created by Fed money-printing & corporate debt for buybacks. Ain't the first durned thing productive about that, so no future to it. Other part is seen in the Dow in Gold & Dow in Silver charts. Both of those show a PRIMARY DOWNTREND that will last another 6-8 years. The first leg of that, 1999 - 2011 shaved 85% of the value off stocks. Correction 2011 - 2015 was nothing, peanuts, sawdust. From the December high stocks will lose ANOTHER 85% of their value against metals. I don't have to worry, I ain't fretted, I can patiently wait for the trend to unroll, WITHOUT the risk of depending on the criminals at the Fed to keep on pumping imaginary money into an imaginary market to raise imaginary prices. Have I made myself clear? Or am I so mealy mouthed y'all missed my point? TODAY stocks rose based on the LYING government jobs report. Dow rose 191.48 (1.04%) to 18,543.53. S&P500 rose 18.62 (0.86%) to a new high at 2,182.87. The US Dollar Index rose 45 basis points to 96.17 on the LYING government jobs report, from speculators begging that the Fed might just raise interest rates in September. That, of course, won't happen, BUT EVEN IF IT DOES it won't make as much difference as freezing to death at 10 degrees or 5 degrees. Y'all ought to be used to these silly sudden moves by now. Dow in Silver went back to its last low then bounced up through its 20 day moving average. Pray, mark that this occurs AFTER the June breakdown that shattered support from the lows that had held since February, and also completed a descending triangle by breaking down from it. All this is occurring miles below the 200 day moving average, so momentum is downward with the same intensity that pulls down a corpse weighted by concrete overshoes and chains. Yet deal we must with the appearance of a double bottom. Yea, it might well be, but if so 'twill make itself known by piercing the 50 DMA above and that old support line. Don't bet on that, don't draw to inside straights. Dow in gold has not fallen as enthusiastically as the Dow in silver since this began in December. However, it's fallen enough. Today carried it back up to the 20 DMA, which is hardly a turnaround but may signal some sideways movement for a while. Of course, all this upward enthusiasm could vanish Monday like mist in July sun, as it so many times has already. Gold tumbled $22.40 (1.6%) to $1,336.40 on Comex. Silver fell 3.1% or 62.6¢ to 1978¢. Repeat after me, "Silver is always more volatile than gold, both upside AND downside." Gold fell back through the upper boundary of its channel (pink line) & toward the 20 DMA and the uptrend line (blue), but fell not through them. So far so good, but volume shot up, confirming the move's direction, and MACD almost turned down. If it breaks that support line, it could trade back to the 50 DMA (now $1,308), about the neighborhood of the last low at $1,310.70. Monday will tell. Silver poked through the 20 DMA (2013¢) and sliced through the blue uptrend line to close slightly below it. Bad juju. Most likely target is 1927¢, scene of the last two lows. MACD has turned down. For those of y'all chafin' at what appears to be my 180 degree turnaround, stop. I didn't plan on, & the metals only partly hinted at, a lying government jobs report. However, the influence of that won't last any longer than a half-pint among professional drinkers. Y'all relax and go enjoy supper with your spouses tonight. The silver & gold uptrend that began in December remains safe. Besides, the yankee government and criminal central banks around the world are every one working, night and day, to drive silver & gold up. I believe in 'em. Yankee government on 5 August 1861 levied the first income tax, a tax on individuals then, as now, one cannot find in the constitution. Thus began the Riddle of the Income Tax. Don't ask me how they do it or who it applies to. Y'all know already I'm jes' a nat'ral born durned fool from Tennessee. This post Janet Yellen: 21st-Century Houdini appeared first on Daily Reckoning. Harry Houdini was the greatest escape artist of the 20th century. He escaped from specially made handcuffs, underwater trunks and once escaped from being buried alive. Now Janet Yellen will try to become the greatest escape artist of the 21st century. 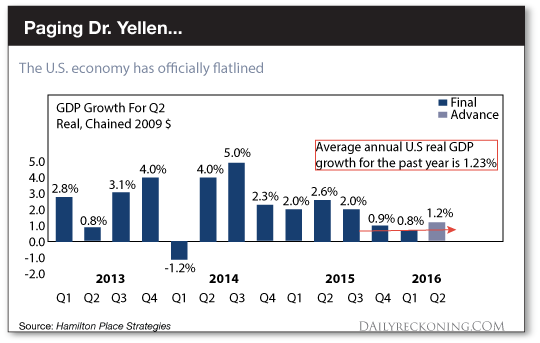 Yellen is handcuffed by weak growth, persistent deflationary trends, political gridlock and eight years of market manipulation from which there appears to be no escape. Yet there is one way for Yellen and the Fed to break free of their economic handcuffs, at least in the short run. Yellen's only escape is to trash the dollar. Investors who see this coming stand to make spectacular gains. Yellen and the Fed face as many constraints as Harry Houdini in trying to escape a potential collapse of confidence in the U.S. dollar and a possible sovereign debt crisis for the United States. Let's look at some of the constraints on Yellen — and the possible "tricks" she might use to escape. The first and most important constraint on Fed policy is that the U.S. economy is dead in the water. Quarterly GDP figures have been volatile over the past three years, with annualized real growth as high as 5% in the third quarter of 2014 and as low as minus 1.2% in the first quarter of 2014. We have not seen persistent growth or a definite trend — until now. Finally, there is a trend, and it's not a good one. Inflation would help to solve the U.S. debt problem because it would lower the real cost of the debt. Making the debt burden sustainable is not about real growth; it's about nominal growth. Nominal growth is what you get when you add inflation to real growth. For example, if real growth is 2% and inflation is 2%, then nominal growth is 4%. Since debt is repaid with nominal, not real, dollars, then 4% nominal growth is enough to make debt sustainable even if deficits are 3% per year. The problem is that inflation is not 2% (what the Fed wants). Right now, inflation is closer to 1.5%. With 1.5% inflation and 1.23% real growth, nominal growth is still only 2.73%. That's not enough to sustain deficits of over 3%. The third constraint on the Fed is political gridlock. The Fed might be able to cause some inflation if they could employ "helicopter money." The use of helicopter money requires cooperation among the White House, Congress and the Fed. Basically, the White House and Congress would agree on massive spending programs and larger deficits. The Treasury would finance the deficits by issuing more bonds. Then the Fed would buy the bonds with printed money and promise never to sell the bonds. The debt would stay buried on the Fed's balance sheet possibly forever if "perpetual" bonds were used. Unfortunately for the Fed, there's almost no possibility of helicopter money this year. The U.S. has to get past the presidential election. They need to see which parties control the House and Senate and then try to achieve some consensus on a new spending program. That won't happen until February 2017 at the earliest. That's too late to get the U.S. out of its flat-line growth trend this year. The fourth constraint on the Fed is their desperate race against time. The Fed needs to raise interest rates so they can cut them when recession hits. The problem is that U.S. economy may be in recession before the Fed can normalize interest rates. If the Fed cannot cut rates enough to get the economy out of recession, it could become a permanent depression, as happened in Japan. My own view is that the U.S. has been in a depression since 2007 (defined as persistent below-trend growth). Japan has been in depression for over 25 years; the U.S. has been in depression for nine years. The entire world seems headed in the same direction. Here's the math. Economists estimate that the Fed has to cut interest rates about 350 basis points (3.5%) to offset the effects of a recession and stimulate a return to growth. Today, the Fed funds rate is 0.25%. The Fed would have to raise rates 3.25% before the next recession in order to cut them 3.5% to fight that recession. If the Fed rushes to raise rates now, they will cause the recession they are trying to avoid. The Fed's actual policy has been to do nothing and hope for the best, but that strategy is running out of time. Those are the Fed's handcuffs — weak growth, persistent deflation, no helicopter money and no ability to cut rates to avoid recession. How can the Fed escape these constraints? How can the Fed get the inflation it needs both to sustain the debt and facilitate rate hikes? At Currency Wars Alert we use the IMPACT system to forecast changes in exchange rates based on inflation, deflation, interest rates and other central bank policies. The IMPACT system uses intelligence techniques I learned at the CIA for predicting terrorist attacks and other geopolitical shocks. The IMPACT system looks for what intelligence analysts call "indications and warnings" that are unique to a particular course of events. Once these indications and warnings are spotted, the analyst has a good idea of what path is being taken and what the final destination will be. The Fed's final destination is inflation — the Fed needs inflation to escape its handcuffs. What are the indications and warnings of inflation from a policy perspective? There are four ways to get inflation when rate cuts are off the table. These four ways are helicopter money, world money, higher gold prices and currency wars. As mentioned, we may see helicopter money in 2017 if there's political will in Congress and the White House. But helicopter money does not guarantee inflation. People and companies on the receiving end of government deficit spending may just save the money or pay down debt instead of spending more themselves. This behavior negates the "multiplier effect." But that doesn't mean it won't be used anyway. The Fed never lets reality get in the way of trying out a bad idea. The second way to get inflation is for the IMF to issue world money in the form of special drawing rights, SDRs. This may happen in the next global financial crisis, but it won't happen in the short run. The IMF moves even more slowly than the Fed. SDRs may be issued in sufficient size to cause inflation in 2018. But it's unlikely to happen before then. However, this method is so extreme from a central banker's perspective that I don't expect it except in the most desperate circumstances. We may see this in 2019, but it's unlikely to happen sooner. That doesn't mean gold won't go up on its own — it will. It's just that investors should not expect the government to force the price higher by official action anytime soon. If we can potentially expect helicopter money in 2017, SDRs in 2018 and a high official gold price in 2019, what can we expect here and now? How can the Fed cause inflation in 2016? There's only one way to escape the room right now — currency wars. The Fed can trash the dollar and import inflation in the form of higher import prices. You can bet a cheap dollar will be on the agenda Sept. 4, 2016, when the G-20 Leaders meet in Hangzhou, China. A cheaper dollar is a complicated play, because it involves other currencies. If the dollar goes down, something else has to go up. It won't be the Chinese yuan or pounds sterling. China and the U.K. have serious growth problems of their own and need a cheap currency too. If the dollar goes down, then the three forms of money that have to go up are the yen, the euro and gold. The post Janet Yellen: 21st-Century Houdini appeared first on Daily Reckoning. Over the past two weeks the precious metals complex has retested its Brexit breakout and rebounded back to the July highs. Today’s jobs report has pushed the complex lower but has delivered an opportunity to cash heavy portfolios which have missed the bulk of the move. With that said, we wanted to share our current analog charts for Gold, gold stocks and junior gold stocks which suggest continued upside potential in the sector. The gold miners’ stocks have already enjoyed a phenomenal year, blasting higher with gold’s new bull market. This sector’s market-dominating performance has been amazing. Yet incredibly, the gold stocks are only now entering their strongest time of the year seasonally. Historically during bull-market years the gold stocks have enjoyed massive autumn rallies on average, starting right about now which is very bullish. Gold-stock performance is highly seasonal, which certainly sounds odd. The gold miners produce and sell their metal at relatively-constant rates year-round, so the temporal journey through calendar months should be irrelevant. Based on these miners’ revenues, there’s no reason investors should favor them more at certain times of the year than others. Yet history proves that’s exactly what happens in this sector. Gold in sterling was 2.2% higher yesterday and was marginally higher in dollar terms after the Bank of England cut interest rates to all time, 322 year record low at 0.25% and surprised markets by renewing and aggressively expanding quantitative easing or QE. Sterling fell sharply on markets and gold rose from £1,014/oz to over £1,036/oz where it remains this morning. Ultra loose monetary policies are now even looser after the BOE cut interest rates for the first time in more than seven years and launched a bigger-than-expected package of monetary measures. After suffering a crippling hack earlier this week, Hong Kong-based bitcoin exchange Bitfinex said it may spread the loss among its users, including ones not directly impacted by the hack. "We are leaning toward a socialized loss scenario among bitcoin balances and active loans to BTC-USD positions," the exchange wrote in a blog post Friday. Bitfinex is still "settling positions and balances," and will provide more details soon, it said. This week's attack is potentially the second-largest on an exchange since Japan's Mt. Gox, and could further erode confidence in the virtual currency. Bitfinex was the largest exchange for U.S. dollar-denominated transactions over the past month, according to bitcoincharts.com, and the attack sent bitcoin's price plunging more than 20 percent. Gold has a “clear presence” to play in a world dominated with ‘global economic uncertainty” My analysis shows that gold will be implemented to protect ‘global purchasing power’ and minimize losses during our upcoming periods of ‘market shock’. It serves as a high-quality, liquid asset to be used when selling other assets would cause losses. Central Banks of the world’s largest long-term investment portfolios use gold to mitigate portfolio risk in this manner and have been net buyers of gold since 2010.